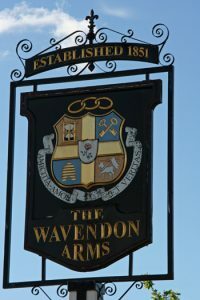 The Wavendon Arms sign has an interesting history! The Wavendon Arms was orignally named ‘The Leathern Bottel’. The date on the sign is 1851 although it’s known that there was an alehouse on this site for at least 100 years before that. When the Leathern Bottel was re-developed (in 2008 I think) the new owners wanted to reflect the historic nature of the location and, as the pub had a long association with ‘The Oddfellows Friendly Society’ it was decided to adopt the Oddfellows coat of arms as the pub sign. The Oddfellows was one of many friendly societies that were established in the 18th and 19th century for mutual support and aid in bad times. They were, in fact, a sort of insurance company owned by the members. each member paid-in a small sum each week and, if they were ill or out of work and needed help they could apply to the society for relief until better days. The Oddfellows still exists today – the nearest Lodge being in Bedford – although they are more like a Rotary Club or Masonic Society now. Ironically, when the pub was re-developed the builders destroyed the Oddfellows meeting house and turned it into the current kitchens. For more about what the symbols on the sign mean ask the Pub Management. They have a sheet detailing it’s full history and symbolism. Look out for more Wavvie QRs around the village!